I’ve been experiementing with peanut butter ice cream ever since I enjoyed a sundae with it at Creole Creamery. I knew I wanted to use chunky peanut butter for that added peanut taste but it has taken a bit of experimenting to get everything right. My first version, using the base I use for most ice creams, was as thick as fudge. Good but too hard to eat. The next time, I added more milk but that thinned it out too much. This version had additional cream instead and was excellent! 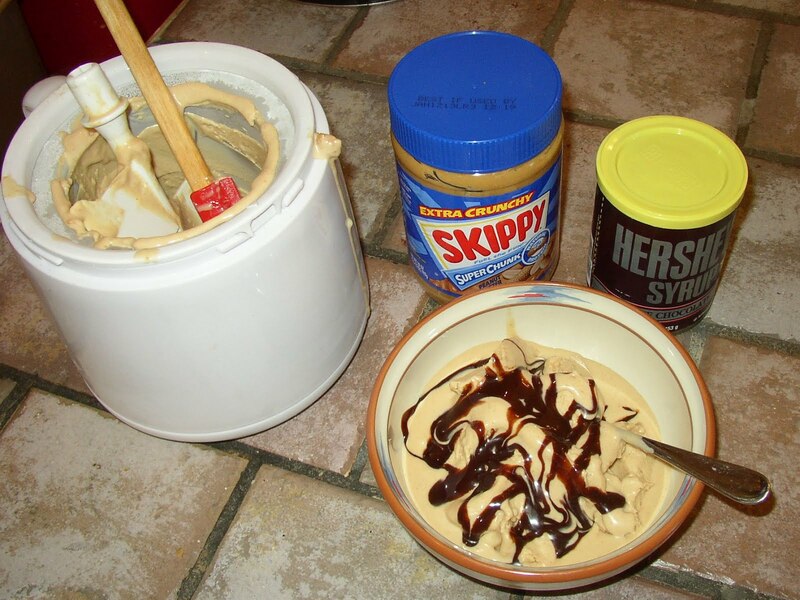 Put the peanut butter and sugar in a blender and combine until smooth. Add the milk. Blend on low speed until well mixed and the sugar is dissolved. Stir in the heavy cream and the vanilla (don’t stir too much, just a few pulses until it’s well mixed). Pour into an ice cream maker and follow the manufacturers instructions. Remove to a container and freeze overnight for the best consistency. Serve with chocolate syrup. I had a meeting over in Lafayette that ended around 1pm so I scooted over to Prejean’s before heading back to New Orleans. 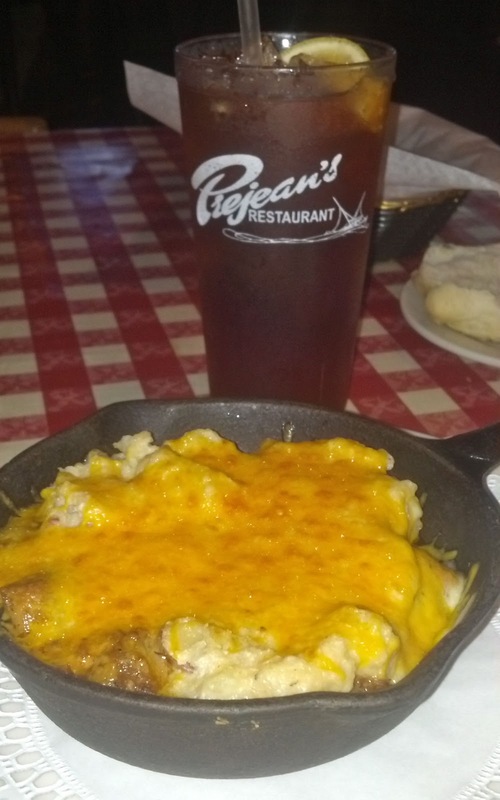 Prejean’s is a very well known Cajun restaurant that I’ve been meaning to try for a while. Unfortunately, every time I drive across the state, I seem to hit it at the wrong time of day. I had a tough choice to begin my meal. As I was there by myself, I knew if I wanted to be capable of driving the 151 miles back home, I could eat an appetizer or have dessert but not both. 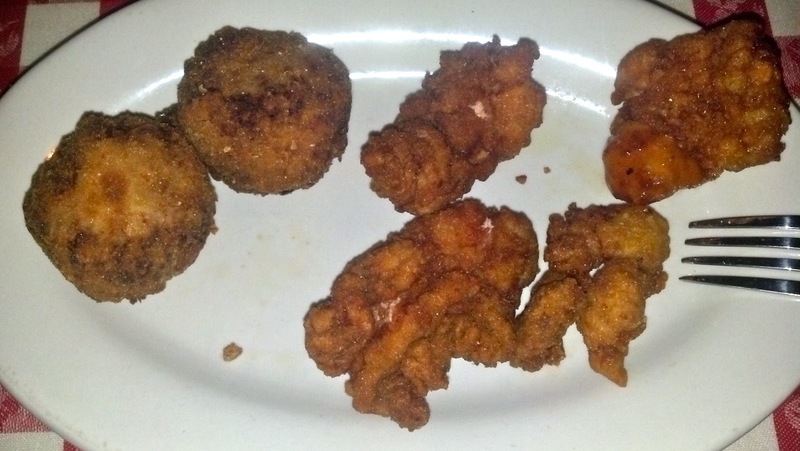 Despite the temptation of Banana Fosters cheesecake, I was in Cajun country so I went with Croc de Jacques – deep fried bites of alligator. Nice flavor although I wasn’t too sure about the cocktail sauce that came with them. I prefered them on their own. The round things to the side are boulettes (fried balls of meat) and tasted sort of like crawfish hushpuppies. They were a little too heavy for my taste. My entree was Cochon du Lait Pie – slow roasted pork debris topped with mashed potatoes and cheddar cheese and baked in a skillet. What’s not to like in those ingredients? The pie was very good – the pork was so very tender and flavorful and, while the potatoes weren’t thoroughly mashed, they were delicious with the cheese and helped to cut some of the spiciness of the dish. The server was excellent. She was quick and efficient – I’d get two thirds of the way down my glass of iced tea and she’d put another one on the table. The food came to the table fast and she was in constant motion, making sure everything was fine. This is definitely a good place to stop for lunch. They advertise live music nightly, so take your chances with that as the food is worth it. Went to lunch in the Warehouse District with my friend Beth today. We visited Root, a fairly new restaurant that “offers Modern American cuisine rooted in traditional flavors and techniques.” While I’m not entirely sure what that means, I do know that this is definitely the place to get your meat fix. Their menu is filled with an intriguing selection of charcuterie and sausages. We started with the “CBD” which is a Chicken, Beef, Duck-Poached Ballotine (the meat moussed and rolled and wrapped in skin and poached). 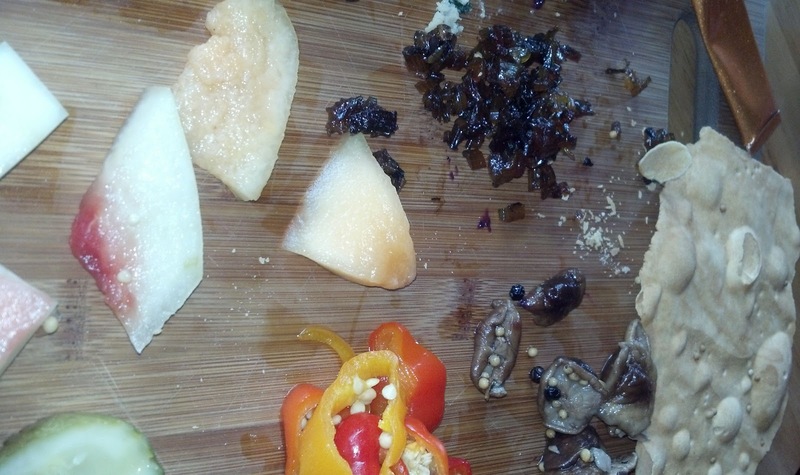 It came with a selection of pickled things – watermelon rind, cantaloupe, mushrooms, peppers, bread and butter cucumbers, etc. as well as with some house made blueberry mustard. Rich and delicious, I dived in so quickly that, when I remembered to take a picture, we had almost devoured everything. For the main course, Beth went with her favorite – the Root burger. It was a good sized burger with a lovely flavor combination of thick bacon, sweet caramelized onions and aged cheddar complimenting the beef patty. 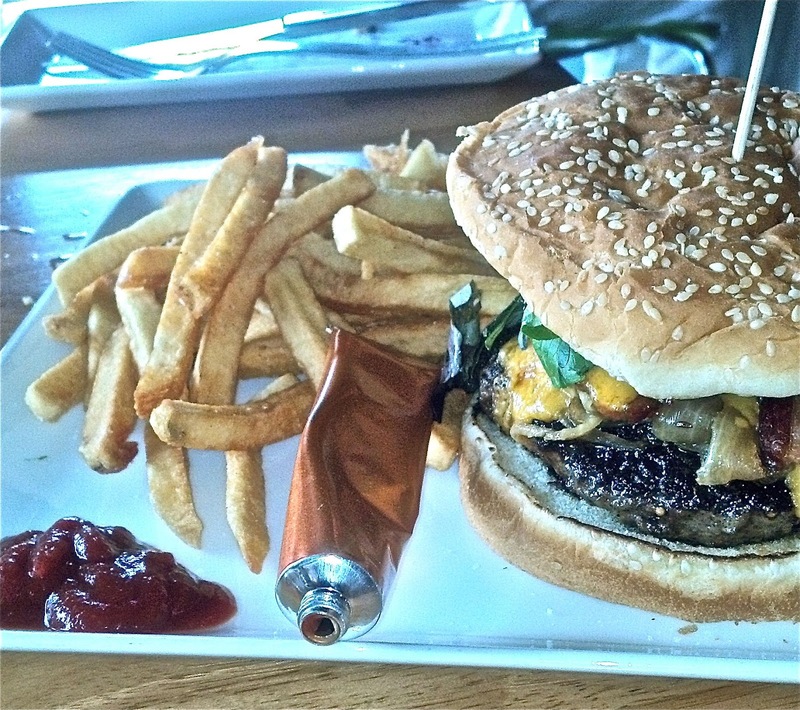 It comes with fries and house made ketchup (yum!). 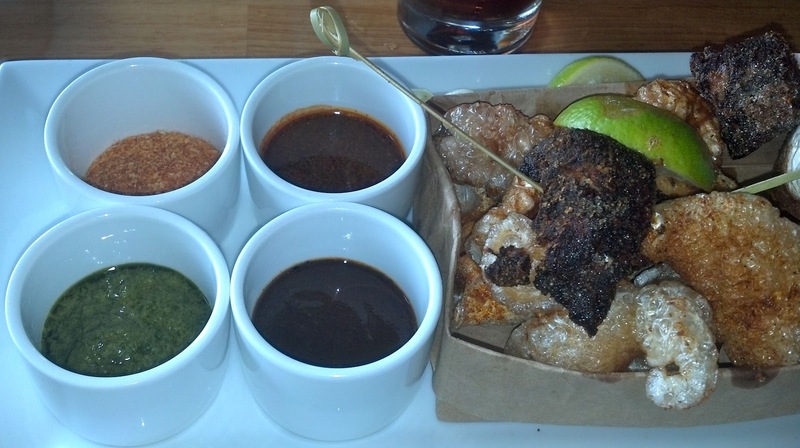 I went for the Chicharrones Two Ways – pork skins and pork belly with several flavorful dipping sauces. I’ve got to say that while the mole in particular was really good, the crackling and pork belly were delicious on their own, with nothing but a squeeze of lime juice. I wish I hadn’t been too full for dessert as they have quite a wild selection. I consoled myself that there is always next time! The wait staff was friendly and informed and spoke quite intelligently when we had questions about the terms on the menu. It was with their help that I walked out with small tubes of blueberry mustard and fig mustard to enjoy at home. Pretty much every item on the menu is an interesting twist on what you’d expect, making this very much a place to go to see what is new and exciting food preparation. It may be a little pricey for lunch but, we all deserve to treat ourselves occasionally! One fish, two fish, fresh fish good! 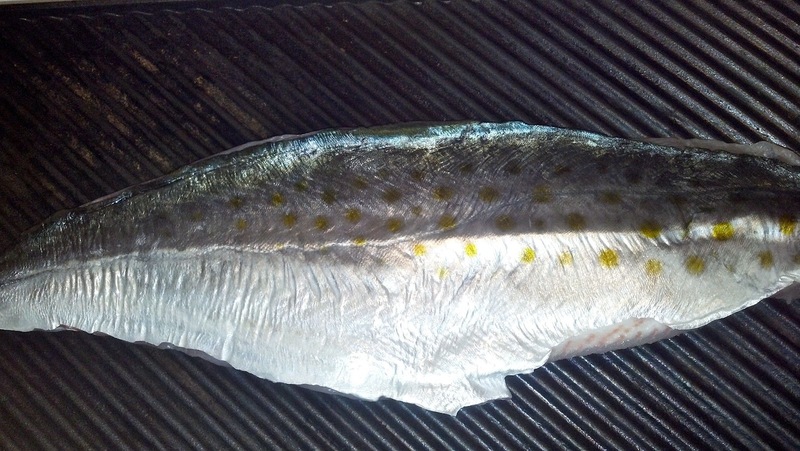 Accompanying this fish will be some of my mom’s cornbread. She’s never actually used a recipe so it took some doing to get this one. I had to stop her at each pinch, dab and dollop to actually measure things out. Preheat oven to 425 F with the skillet in the oven, melting the Crisco. Mix all other ingredients in a large bowl. Pour in a portion of the melted shortening until it is a loose but not runny consistency. Pour the mixture into the skillet, over the remaining shortening. Cook for 25 minutes, until the top is golden brown. For added corn flavor, replace all but 1/4 cup of all purpose flour with corn flour and replace 1/4 cup of corn meal with a coarse, stone ground corn meal softened in 1/4 cup of milk. Every single person who deliberately ate at Chick-fil-a on Wednesday and claimed they did so to protect Freedom of Speech or Freedom of Religion is operating under a misconception. beliefs which differ from mine and I will defend their right to express them and I will fight any attempt to silence them. But this isn’t about Christianity, the 1st Amendment or two crucial pickles. It is about money from patrons being spent to fight the equal treatment of other patrons. The 990′s filed with the IRS by WinShape are publicly available and show that money from Chick-fil-a is going to fund more than just summer camps to strengthen traditional marriage. It has given more than $5 million to groups like the Family Research Council and the American Family Association that spread lies and hate, that teach scientifically repudiated “ex-gay” therapy and that have worked to put into law death sentences for homosexuals. If there were any doubt about where your money is going, Herman Cain went onFox News today to say that $30 million dollars from Wednesday’s Chick-fil-a Appreciation day is going to fund anti-LGBT groups. The profit from that meal you just enjoyed is going to oppose my receiving equal treatment under the law. You and I both know there is not a single, credible, non-religious reason to deny equal rights to LGBT people. Instead of working to end injustice, however, you’ve just funded organizations that are working to deny other people rights that you possess. criminalize your consensual sexual behavior. We’re not trying to make anyone a second class citizen or place undue taxes on anyone else’s relationships. But that is exactly what the organizations funded by WinShape are trying to do. Our rights aren’t special; they are the exact same ones you enjoy because you happen to have been born a heterosexual. Please try to put yourself in our place. If someone you cared about came to you and told you that someone hurt them, would you respond by going out and buying lunch for the aggressor? I’m not asking you to go on a hunger strike in solidarity of the LGBT community or even to support marriage equality. All I want is for you to be mindful that the money you spent to buy that meal is being used to harm people you know and love. How about you donate the amount of that sandwich, waffle fries and drink to an LGBT equality organization like Forum For Equality? It is easy to donate, just click here!